Personal offices, pop-up shops, retail stores, drive thru restuarants, beach houses; the uses for converted shipping containers is almost endless. 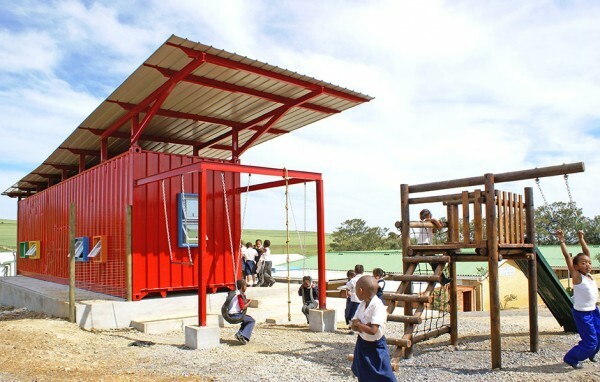 Recently Tsai Design Studio have converted a used 40 ftoo shipping container into a classroom on the outskirts of Cape Town, South Africa. 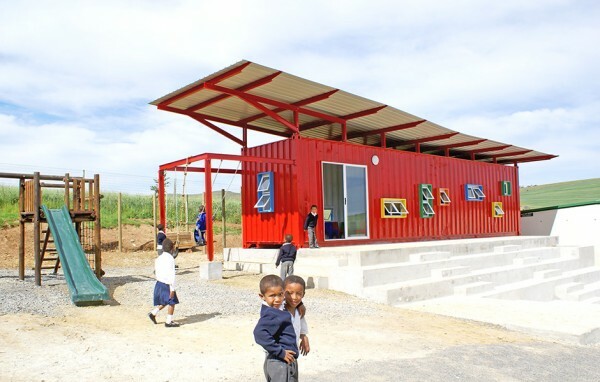 The Vissershok Container Classroom, which has recently won the silver Loerie Award for architecture, offers rural primary school children a tranquil environment where they can learn, grow their own vegetables, and–of course–run around outdoors. Set in the wine valley of Durbanville, Vissershok Primary School assembles children ages 5 through 6 from the nearby, poverty-stricken township of Du Noon. In need of an affordable plan to assist low-budget schools, the retail store Woolworths offered local high schoolers a competition to redesign shipping containers as tools to assist underprivileged communities. The winning design was from 15-year-old Marshaarn Brink, who proposed a playful and multi-faceted facility where kids can enjoy outdoor play and the unit itself can be a dual learning and library center. Tsai Design Studio then refined Brink’s idea to include four sections: Learn, Gather, Play, and Grow, keeping within an accommodating budget. In the learning area, which is inside the structure, children attend their lessons in the morning and can then browse through the posterior library. For comfort, the roof is installed as a shield to protect the container from intense sun rays, while the raised gap reduces heat gain. Ventilation is provided by an array of windows all throughout the classroom. The steps in front of the center make up the gathering area, which is used for social hour and school assemblies, while the play area includes swings and a jungle gym. Finally, in the grow area children can plant vegetables in the garden, providing them with their own feeding program. This entry was posted in Blog and tagged 40 foot shipping container, converted shipping containers, shipping container, shipping containers.